Phast Phreddie the Boogaloo Omnibus is in the red and DJ Rata is armed with a smoothie and a cookie at the WHAM-O WATUSI!! On the second day of December, the WHAM-O WATUSI returned to its regularly scheduled night–the first Saturday of the month–at its regularly scheduled home–the Bootleg Bar. On hand to make it special was DJ Rata. Rata is one of the most popular guest DJs at the WHAM-O. 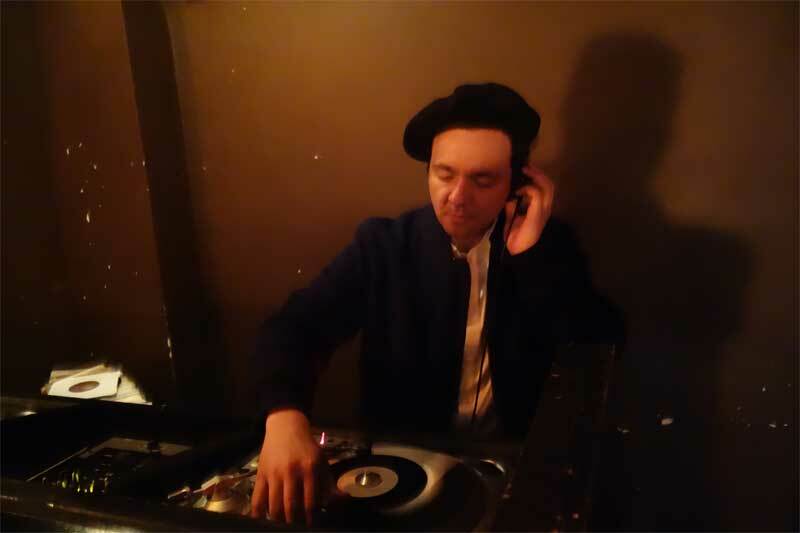 He plays jump blues, R&B, mambo, ska, rockabilly, reggae and Latin boogaloo–everything that is reet. When he is at the turntables, the kids all hop non-stop! This can be witnessed whenever he hosts Mambo Jambo at Otto’s Shrunken Head–the third Saturday of the month. 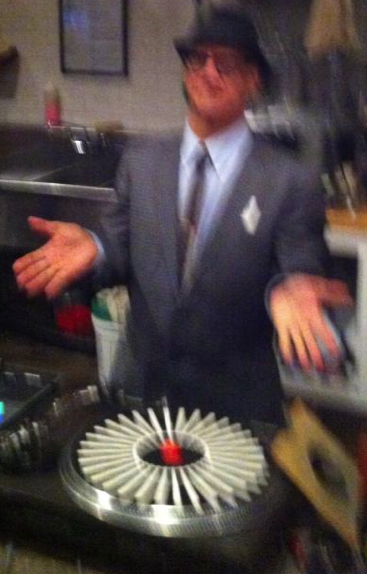 DJ Rata selects another reet disc at the WHAM-O WATUSI! On this night, host Phast Phreddie the Boogaloo Omnibus played “Ratty Ratty” by Maskman, then presented it to Rata as a gift. Rata reciprocated by giving the Phastman a copy of “Esperma y Ron” by Pedro Laza y sus Pelayeros–a cool cumbia from Colombia coveted by The Boog. The Phastman played it at the earliest opportunity, then followed it with another Pedro Laza record that he already had in his box. DJ Rata and Phast Phreddie the Boogaloo Omnibus exchanged 45s at the WHAM-O WATUSI! Phast Phreddie the Boogaloo Omnibus presents the baker of super fine cookies, Nancy “Jeannie” Gardner at the WHAM-O WATUSI! Happy to see the gang at the WHAM-O WATUSI! Ryan Sweeting from Florida, Brandan Pierce Peck, DJ Rata, Candis Conover, Lauren Krohn and Phast Phreddie the Boogaloo Omnibus with Nancy’s cookies (she was taking the photo). Rata had just picked up a copy of “Boogaloo Frog” and the Phastman made sure he played it. When he did, the Phastman did a frog dance! Phast Phreddie the Boogaloo Omnibus shows how to do the Boogaloo Frog at the WHAM-O WATUSI! None of these records are for sale. Some of them have links to the youtubes. Click on them and swing!